I don't like playing games with other people really, but I know a lot of people out there do. Hello Games has a message for this brand of audience, and it's that you should stop thinking about playing No Man's Sky with your friends because it is very unlikely that you will ever be able to. As explained at the PlayStation Experience, No Man's Sky's opening scene drops your character on one of the universe's billions of outer-fringe planets, and you are tasked with simply finding a way to the middle. Stumbling across another player in the infinitely vast, open universe is a small enough chance as it is, but finding one of your friends is even less likely. 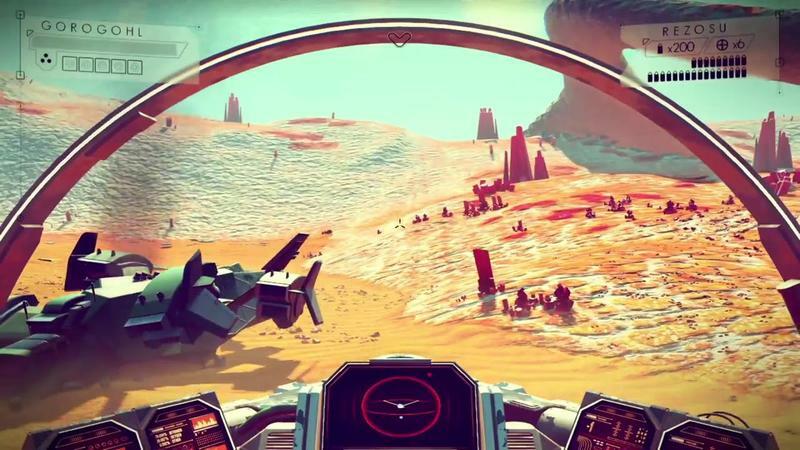 Director Sean Murray explains more in an interview with GameInformer. "People keep asking us about multiplayer and I think when people see this they are going to fully realize what it means to be that far away from somebody else who's playing. And I know that that's a bit weird for people, but it's what's different about our game. And we want to embrace that. We don't want people just scouting off beside their friends. I actually want people to boot up the game and just think, "Isn't the universe huge? Who are we? What are we all doing here?" Murray further explains on how difficult it would be to find your friends, even if you know exactly where they are. People keep saying to us, "Yeah, but what if I knew where they were? Would I go there?" And it's like, yeah, but they are going to have to stay there for quite a while while you get over there. And then once you get over there you might land on the same planet and then you will say, "I'm on a planet the size of Earth and I am on a mountain. Where are you?" Which is, I know, a weird thing and it's a daunting thing." As further explained later in the interview, Murray does not want want this game to become an MMO. People might bump into another player eventually, but their User ID tag will not fly up on your screen. Heck, you might even confuse it for just another AI in the game! Anonymity is another key to the game's success. Think Journey, just on a more infinite scale! In fact, we might never know what our characters even look like! Players do look different from everything else in the universe, but without an ability to see your own reflection anywhere in the game, you might even not know what you are looking at. I think people really haven't thought about that yet. And I think we will probably surprise people in terms of how they look. You effectively see their suit actually. So you won't know what's inside. It still won't answer for people whether you are an alien or whether you are a human or what you look like. It's a great interview, and Murray almost seems annoyed to still be talking about multiplayer. Time to change those traditional thoughts and realize that No Man's Sky is going to be something unique, new, and special. It will release for the PlayStation 4 and PC sometime in 2015.